Day in and day out, criminalists testify to positive, uniquely specific identifications of fingerprints, bullets, handwriting, and other trace evidence. A committee of the National Academy of Sciences, building on the writing of academic commentators, has called for sweeping changes in the presentation and production of evidence of identification. These include some form of circumscribed and standardized testimony. But the Academy report is short on the specifics of the testimony that would be legally and professionally allowable. This essay outlines possible types of testimony that might harmonize the testimony of criminalists with the actual state of forensic science. It does so through a critical analysis of the arguments and proposals of two critics of “individualization” testimony in forensic science. 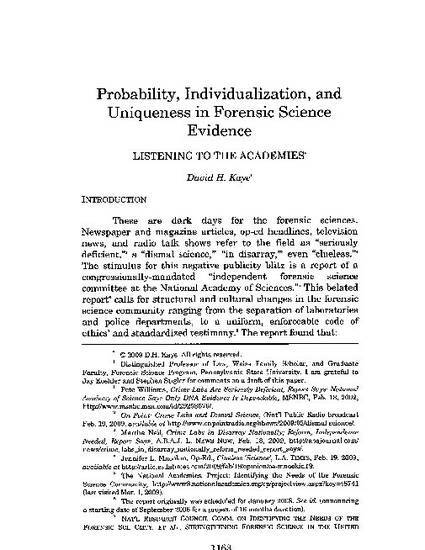 By clarifying the relationship between uniqueness and individualization, the essay advances a slightly less skeptical view of individualization than that expounded by Professors Michael Saks and Jay Koehler. Among other things, the essay argues that there is no rule of probability, logic, or ontology that prevents individualization and that testimony of uniqueness or individualization is scientifically acceptable in some situations. Recognizing that these situations are unusual, however, it also surveys some evidentiary rules and practices that could curb the excesses of the current form of testimony. Publication Information: 75 Brooklyn Law Review 1163 (2010).